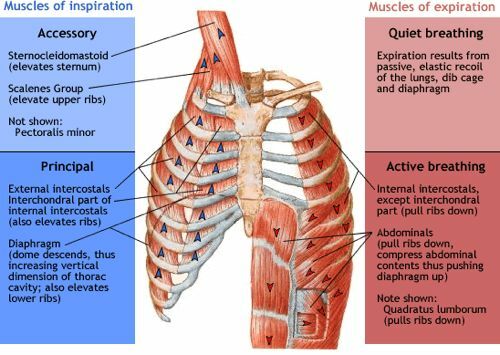 The muscles of respiration are also called the 'breathing pump muscles', they form a complex arrangement in the form of semirigid bellows around the lungs. All muscles that are attached to the human rib cage have the inherent potential to cause a breathing action. Muscles that helpful in expanding the thoracic cavity are called the inspiratory muscles because they help in inhalation, while those that compress the thoracic cavity are called expiratory muscles and they induce exhalation. These muscles possess exactly the same basic structure as all other skeletal muscles, and they work in concert to expand or compress the thoracic cavity. The primary inspiratory muscles are the diaphragm and external intercostals. Relaxed normal expiration is a passive process, happens because of the elastic recoil of the lungs and surface tension. However there are a few muscles that help in forceful expiration and include the internal intercostals, intercostalis intimi, subcostals and the abdominal muscles. The muscles of inspiration elevate the ribs and sternum, and the muscles of expiration depress them.. The accessory expiratory muscles are the abdominal muscles: rectus, abdominis, external oblique, internal oblique and transversus abdominis. And in the thoracolumbar region the lowest fibres of iliocostalis and longissimus, the serratus posterior inferior and quadratus lumborum. Origin: Xiphoid process (posterior surface), lower six ribs and their costal cartilage (inner surface) and upper three lumbar vertebrae as right crus and upper two lumbar vertebrae as left crus. Nerve Supply: Motor nerve supply by Phrenic nerve (C3 C4 C5) and sensory supply by phrenic nerve to central tendon and lower 6 or 7 intercostal nerve to peripheral parts. They are three types: External intercostal muscles, internal intercostal muscles, and innermost intercostal muscles. It is an incomplete muscle layer and crosses more than one intercostal space. These muscles assist in the function of external and internal intercostal muscles. Nerve supply: all the intercostal muscles are supplied by their respective intercostal nerves. ↑ 2.0 2.1 Pamela K. Levangie, Cynthia C. Norkin, 2005, Joint structure and function: A comprehensive analysis, 4th. Edn, Philadelphia, FA Davis publishers.